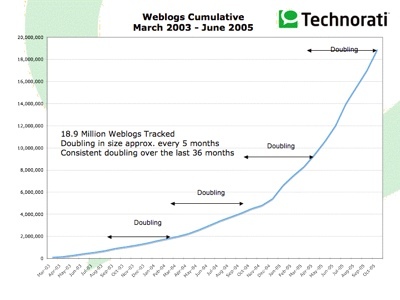 Dave has new numbers about the state of blogs based on Technorati data. He has his presentation from Web 2.0 online as well as a lengthy blog post. Interesting stuff. Take a look. I think her stories are true, even the 'beef soup' part. To me, her story is not about Japan's attrocities but human capacity for inhumane acts. People we see on the street every day, smiling and considerate, can do terrible things under certain conditions. To put it more bluntly: I think everyone, including me, are capable of serving that 'beef soup'. Of course, I am not suggesting that such actions should go unpunished or forgiven. Rather, such actions should be severely punished to raise the wall that confines our beastly nature higher. O.k. back to the topic: My problem with any information about blogs is that there is no distinction between the different types of blogs. If you talk to people and they know what a blog is, they think you just have your diary online. But many companies use blog-CMSes or even Blogger. Blogs link B2B and B2C or collect news regarding designer toothbrushes. A blog does not mean "narcistic chit chat". It is simply a new way to organize a website. The content shifts. yeah point taken. to attribute an act to a "race" or a "country" is to essentially do the same profiling and abstraction of humanity that the soliders in this account did. Joi Ito - "Dave Sifry's updated blog stats" by Joi Ito is licensed under a Creative Commons Attribution 4.0 International License.